Ireland can trace its sacred sites way back beyond the Pharaohs of Egypt and the Pyramids with built evidence in form of burial mounds like this one here at Newgrange. Which is aligned to the Winter Solstice on the 21st of December when the first rays of the rising sun follow the spiral patterns and symbols in the stones to illuminate the burial chamber at the back of the tomb. 5000 years later this perfect alignment constructed by the Celtic astronomers is still working and draws visitors from all over the world to witness the event each year. 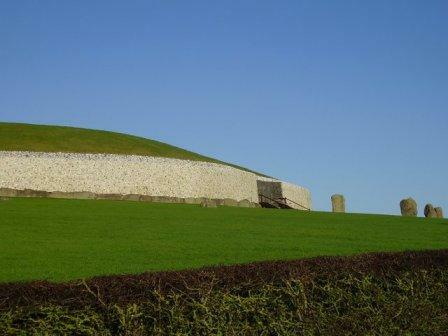 No one knows for sure the purpose of Newgrange, solar observatory, burial chamber and it is only one of 1000’s scattered throughout Ireland. Whatever their purpose, oral legends about Druids and Celtic God and Goddesses were absorbed by Christianity with many of the finest churches, abbeys and monastic sites in Ireland having pagan origins. When St Patrick brought Christianity to Ireland in the 5th century, Ireland entered a Golden Age of Enlightenment and became known as the Land of Saints and Scholars. Impressive churches with high crosses were built at early monastic settlements like Clonmacnoise where the monks began to record the scriptures in beautifully illuminated manuscripts such as the Book of Kells, and intricately crafted metalwork items, inlaid with precious stones like the Ardagh Chalice and the Cross of Cong. But to get an idea of the places and landscapes that inspired the celts and the saints you should try and include one of the following sacred places in your itinerary. For more about the origins of Sacred Sites in Ireland, please click here.